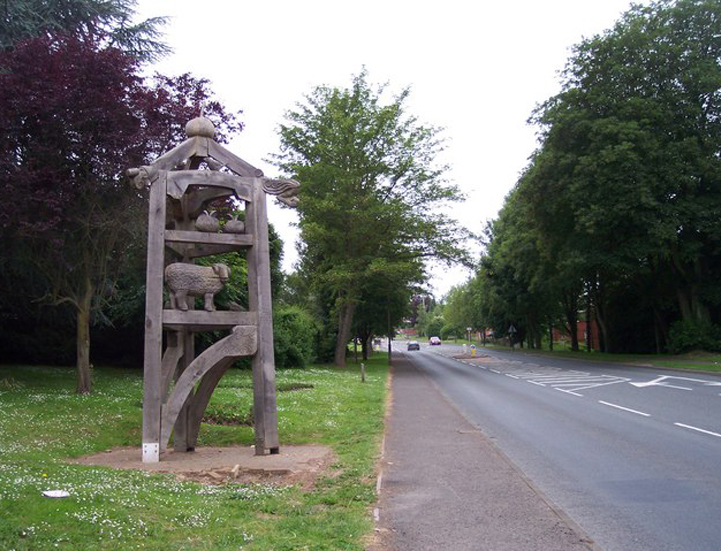 Sited in Nunwell Park on the grass area close to the footpath alongside the Bromyard bypass, it is a sturdy, three legged, oak tower, 5.5m high. The inspiration for it came from the local timber framed architecture - of houses and barns. A number of carved sculptures and surface reliefs are incorporated at significant points and junctions in the structure. Each storey of the tower depicts some aspect of the town; architectural detail, the local toy museum and illustration of the local agricultural industries of hop growing and cider apples. Paul Wigley assisted with the jointing of the structure and Andrew Moran helped with the carving along with two work experience students Chris Lowe and Chris Douglas. The completed structure was transported to the site and craned into position on a concrete base prepared by a local civil engineering contractor who also laid the brick paving which covers the base. The three main legs have stainless steel brackets which are resin bolted to the concrete base.